Cobia fishing is about to begin in Virginia. Cobia arrive in Virginia waters around the middle of May. On Finao Sportfishing we target this species of fish during the Summer and Fall. We target Cobia off of Virginia Beach and Norfolk. Our boat is located at Vinings Landing Marina in Norfolk. This location is perfect for Cobia fishing since it is located on the Chesapeake Bay. 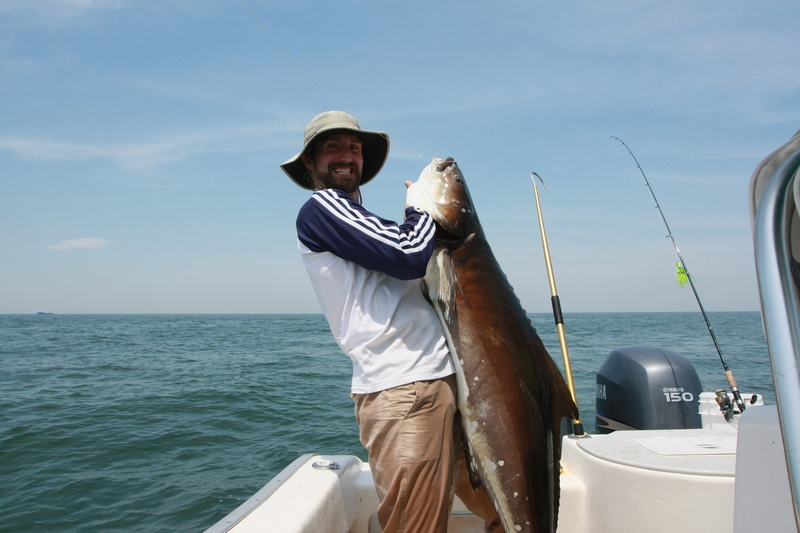 Cobia are one of the largest inshore fish species Virginia has to offer. The average size of a Cobia is about 30 pounds and can grow to over 1oo! A Trophy Size Cobia is 50 inches or 55 pounds. In Virginia when you catch a Cobia of those sizes you are awarded with a wall plaque. People all around the world come to Virginia in hopes to land a Trophy Size Cobia. To learn more about How to Catch Cobia Click Here! There are multiple ways to catch Cobia. A couple of techniques that we use is Chumming, Sight Fishing, and Jigging. Our most common way we Cobia fish on Finao Sportfishing is Sight Fishing. Sight fishing is one of the most exciting ways to catch any species. Our custom built Cape Horn boat has a Sight Casting Tower designed for Sight Fishing. When Sight Fishing it is not uncommon to run into other fish species swimming on the surface. Fish like Red Drum, Black Drum, Shark, Cownose Rays, and Cobia can all be found on the swimming on the surface. When we are Cobia fishing we use top of the line fishing gear. Cobia are powerful fish and can put up a long fight. Cobia often try to get unhooked by jumping and making long strong runs. The fishing gear we use when Cobia fishing is Saltist Spinning Reels, Shimano Rods, Power Pro Braided Line, and Owner Hooks. Using this equipment will ensure your best chance at landing a big Cobia.